The topic of Bugatti is undoubtedly one of the most researched and written about in the international automotive pantheon, especially ango in the last fifty years. While a certain amount of it has been regurgitated from secondary sources for the making of a quick buck on the mass market, serious scholarship is nonetheless ongoing that irregularly unearths important new information. That information then warrants the revision of previous works and from time to time produces new works that add substantially to the body of Bugatti knowledge. Since the publication of H.G. Conway’s Bugatti: Le Pur-Sang des Automobiles in 1963, the vast majority of titles on Bugatti have focused on particular models, or activities, such as the factory’s official involvement in racing. 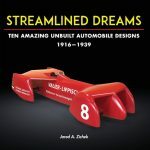 In the intervening years much new material has come to light, particularly concerning Le Patron’s early automotive activities, which have been somewhat clouded in perhaps deliberate and self-imposed mystery, and the establishment of the marque and the works at Molsheim. Much of what had previously been speculation is now documented. That some early and relatively minor myths have been exploded along the way can only be to the overall good, and in the process, Ettore Bugatti is more accurately depicted as a real human being and not some kind of comic book superhero, as some of the legends have grown to portray him. 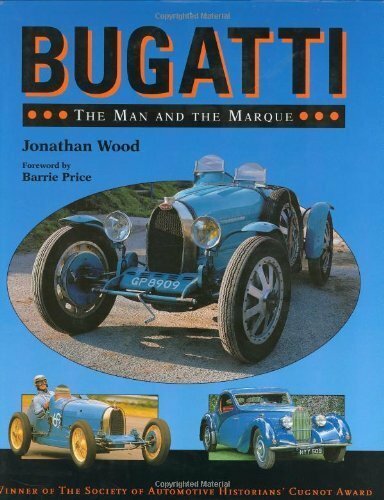 Jonathan Wood’s book is the first revised general history of the Bugatti marque since the early 1960s. That it was awarded a Cugnot Award Honorable Mention by the Society of Automotive Historians in 1992, the year of its first publication, should give one an idea of the high standards it represents. Wood wisely concentrates on the pre-Molsheim and post-World War II eras, where the bulk of recently discovered information has originated. 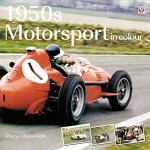 The intervening years have already been exhaustively and collectively covered by other authors, but Wood nevertheless has included new and more detailed information on aspects of that era as well. 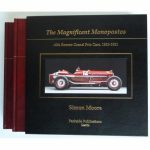 Its 384 large-format (8½ x 11″) pages are easy to read and are profusely illustrated, to use the hackneyed expression, with a good number of photos that have not been previously published. It is narrative in nature with about a third(!) of the book devoted to the period prior to 1920 and the adoption of the straight-eight configuration. 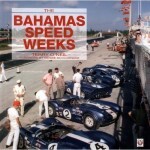 No other Bugatti book that I know of devotes so much coverage to this era. 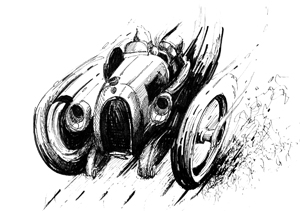 While nothing earth-shaking is revealed, it nevertheless fills in gaps in the story, many of which may well have been due to the direct contrivance of Ettore himself, who had a bit of a penchant for ignoring the inconvenient and/or unflattering parts of The Official History of Bugatti According To Bugatti. This is a direct reflection on the amount and quality of information that has relatively recently been discovered through diligent research and makes the book worthwhile if for no other reason. And there are other reasons, such as the attention devoted to the development of the Type 35 in all its details and iterations, as well as the successor racing models it clearly influenced. A most pleasant and welcome highlight is the amount of space devoted to the Type 41, La Royale, also known as the Golden Bug. Perhaps more misinformation is in circulation about this iconic and arguably best known model than any other Bugatti. 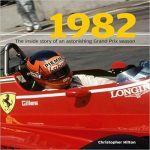 Its 26- page chapter explains why it was in fact a dismal commercial failure (only three of the six chassis produced were sold while the model was current) and details the history through 1991 of each of the six in a manner never previously done. The torturously convoluted history of the prototype chassis, #41100, and the five distinctly different bodies fitted to its two different chassis frames in a period of not much more than six years is detailed and almost reads like a detective story worthy of Sir Arthur Conan Doyle as it explains in a plausible manner why the exact number of cars produced, either six or seven, was uncertain for so many years. Equally well done is the explanation of how the expensive and otherwise obsolete inventory of unused and seemingly unusable engines developed for the Type 41 was successfully adapted to self-propelled high-speed passenger rail car use and how this was not only financially lucrative, but became the salvation of the company when it was most desperately needed. The post-WW II period is commendably covered as well. That history is particularly convoluted and painful for the Bugatti family, which is no doubt why it has not received more thorough coverage previously. The ultimately unsuccessful attempt to revive the marque in the early 1990s is also discussed in some detail. At the time of the book’s writing that attempt appeared to be well on its way to success, but not without problems. Even though the new model (EB 110) was ultimately put into production, and generally highly regarded for its technical specification, its styling was controversial and subject to severe criticism. Initial projections were for a production schedule of 50 cars per year. Although almost 140 were eventually produced, the project proved to be overly ambitious and ultimately failed, but it is part of the post-war Bugatti story. From the standpoint of historical completeness, it is important that it be included. Two nice features are footnote references at the bottom of their respective pages and a comprehensive Index. My singular disappointment, and it is a major disappointment, is the overall mediocre quality of photographic reproduction. This is especially disappointing considering the book’s $100 retail price tag. I can’t help but think this may be a significant factor in the book not receiving more than an Honorable Mention when considered for the Cugnot Award. While the paper used offers excellent, non-glaring contrast for comfortably reading text, there is no substitute for the use of glossy art paper for photographic reproduction, and in a work of this nature, with its heavy reliance on historical photographs, it is regrettable that the decision to use the best paper for that purpose was not taken; especially considering the number of previously unpublished historical photos that are included, and the price asked. I’ve found several photos published elsewhere with far better results, albeit by publishers whose reputation was largely based on their consistently excellent photographic reproduction. Even the 16-page color photo section leaves something to be desired, with the colors being muted and not as vivid as they could be. Again, this appears to be due to the employment of less than optimal paper for the purpose. I know of no other books in this price range that are not printed on high-gloss paper throughout. 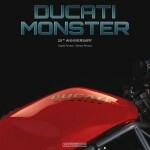 Other Bugatti titles from other publishers have done so, and the finished product has been that much better for it. The book also suffers frequently from faulty proofreading. Metric dimensions and their English equivalents are often irritatingly incorrect. The math involved is usually (but not always) correct, as far as significant digits go, but decimal points often disappear. For instance, Bugatti’s personal yacht, construction of which began in 1939, is described as being “295m (90 ft)” long when the correct conversion should be 967.6 feet. But that’d be significantly longer than contemporary aircraft carriers so the figure in meters is wrong. The 90-foot number, while not strictly accurate, is more in keeping as a credible length for a large private yacht of the times and within an acceptable margin of error for general discussion’s sake. Overall, the book does a commendably fine and necessary job of updating the Bugatti story as of 1992. Is it worth $100? Only you can decide that, but some web searching will locate a new copy at a substantial discount and lightly used copies at even less. The Crowood Press, multiple eds.